I'm trying to use BEPU for a little sideprojct I'm currently working on. So far I've created different elements that can be dynamic and kinematic objects which interact fine. Now I'm trying to create an element that detects intersection with dynamic elements (let's call it a sensor). This works good most of the time, but when a dynamic element is sleeping while intersecting a sensor and is woken up, the sensors CollisionInformation contain no Pairs for the next physic update. The update after that everything is fine and the Pairs will contain the correct data. Also if a kinematic entity pushes a dynamic entity into a sensor, sometimes there will be no pairs at all, regardless of how many physic steps I run. The pairs list is updated upon the addition of a CollidablePairHandler to the narrow phase, and upon pair handler cleanup. The pair handler should persist (i.e. not get cleaned up) for the duration of the broadphase detected overlap regardless of activity state, so I don't have a good explanation for what you observe. In particular, whether a kinematic entity or other force is responsible for making a dynamic move into contact shouldn't affect the existence of pairs at all. Could there be something odd with the collision filtering or the way in which the pairs are being enumerated? It's also possible I've just forgotten some complexity in how v1 handled pairs- it has been a while Can you reproduce the behavior with a small test case in the BEPUphysicsDemos project? 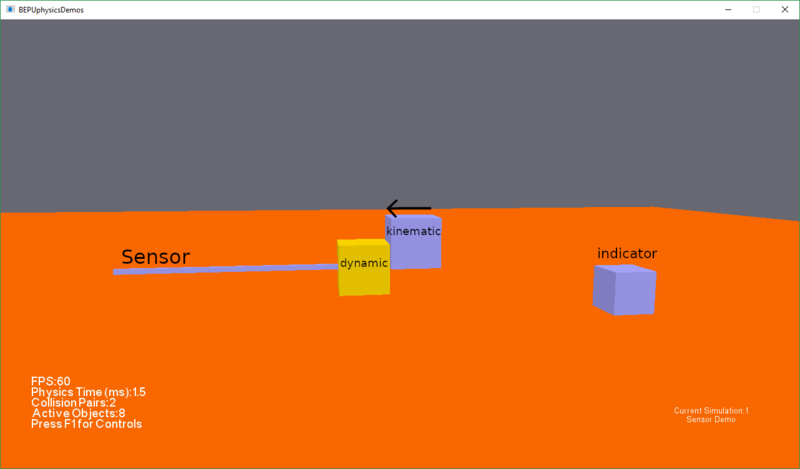 In the Demo the kinematic object will move in steps to the left. Sometimes when the kinematic object moves the dynamic object, there will be no pairs and the indicator will jump up one step. //  Debugger.Break(); // no pairs - oh noes! /// Gets the name of the simulation. Replicated- that's pretty weird! The pairs do indeed get removed due to 'staleness' a frame after activation, only to be readded another frame later. I probably reordered some activation logic in the narrowphase without realizing a dependency eons ago. Until I fix it, a workaround is to set the sensor.ActivityInformation.IsAlwaysActive to true. 1) Dynamic-Sensor pair is found by the broad phase, but both objects are inactive. The pair's 'updated' flag is left unset. 2) Kinematic-dynamic pair is found by the broad phase, and creates a contact constraint with the dynamic, activating the dynamic body. 3) All existing pairs for checked for 'staleness'- if either involved entity is active and the 'updated' flag on the pair is unset, then the pair is considered stale and removed. 4) The next frame, the dynamic is seen as active and the pairs are recreated. In other words, the 'staleness' state of the dynamic-sensor pair depends on when it executes relative to the kinematic-dynamic pair, so there's a race condition. //by new narrow phase pairs will not be momentarily considered stale. Deferring the entire constraint addition pushes a fairly heavyweight bunch of operations into strictly sequential execution. That's why I pulled it into the narrow phase parallel phase in the first place. Some of that expense could be avoided by only doing the activations in a postpass, but that would require some slightly annoying architectural changes. The DeactivationManager.Merge function would need to somehow punt responsibility the activity state changes. DeactivationManager.Add already performs a global lock, so that wouldn't be too horrible to add a queue which is then flushed by the narrowphase alongside the AddNewNarrowPhaseObjects call. Thanks for the awesone and detailed explanations! I haven't done any extensive profiling but for now setting IsAlwaysActive for the sensors seems to work just fine. If I encounter any perfromance problems I'll let you know.